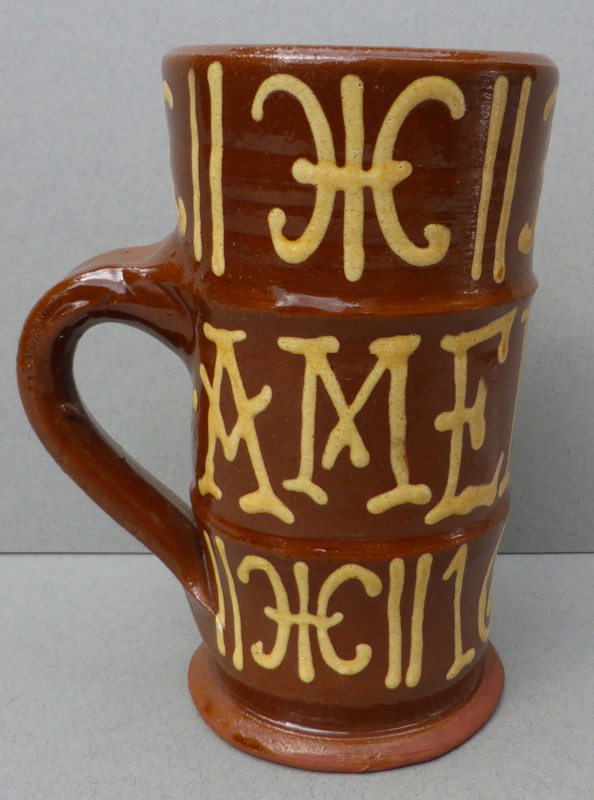 Hello, I'm hoping someone might be able to help identify who made this slipware mug. 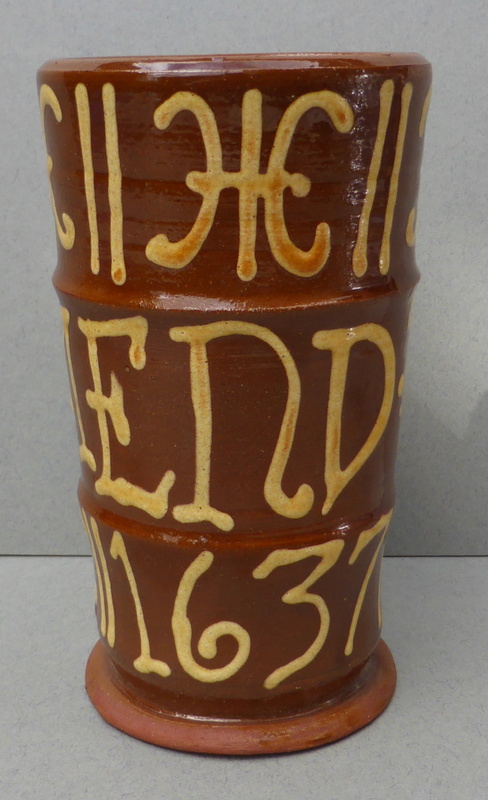 It looks like a reproduction of a 17th century piece and is decorated with typical slip decoration and the inscription 'Amend Thy Way 1637'. 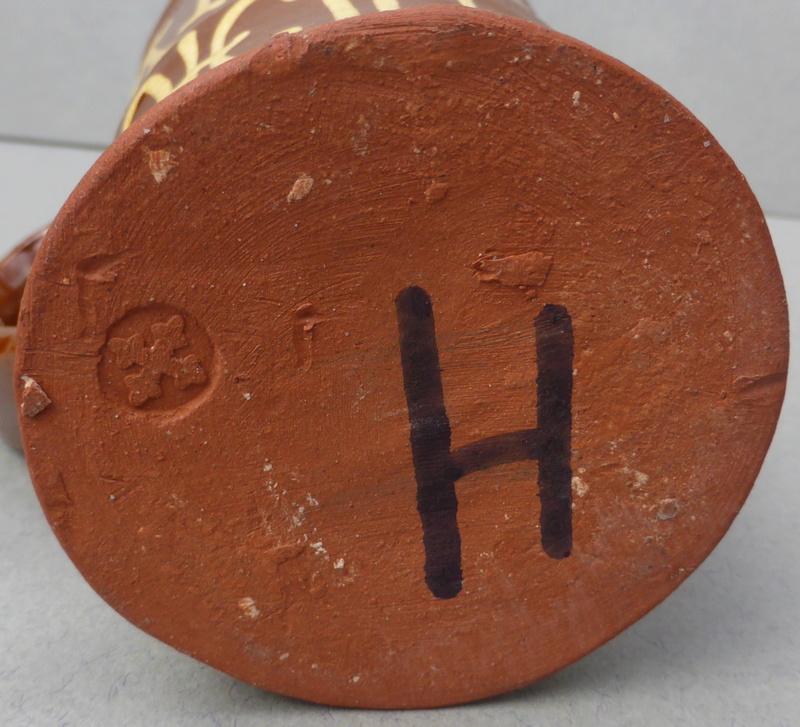 The base is marked with an impressed cross and a large H in marker pen. It stands almost 5" tall. I wish I knew! I’ve come across a number of pieces with the mark, most seem to be reproduction medieval (maybe made for reenactments), and some tourist ware, such as an Offas Dyke plate. 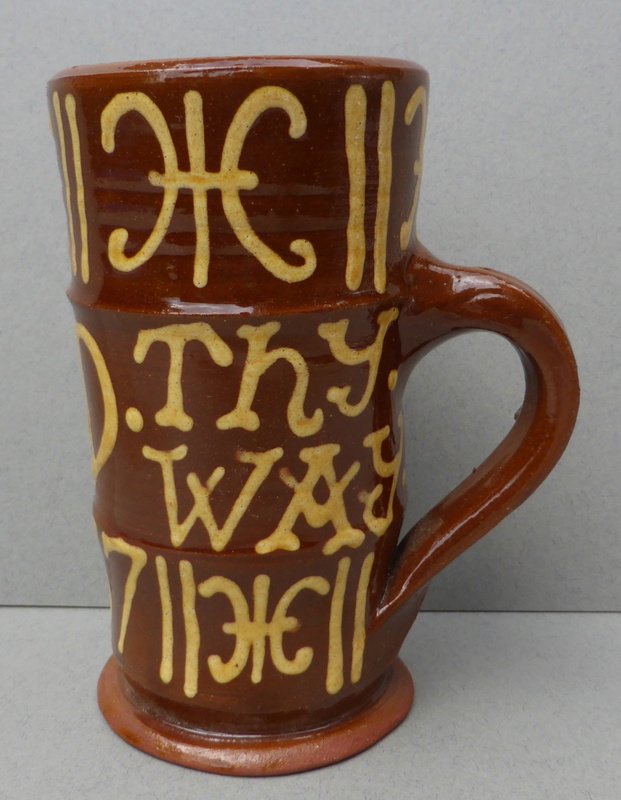 Possibly made in the 60s give or take a decade, and possibly made at one of the Abbey potteries. Hi Naomi - yes I've seen a few pieces as well. I live in Derbyshire and in the last few months I've seen about 4 or 5 pieces as different boot sales/yard sales. Because of this, I did wonder if it might be someone local to me. Intriguing!! Interestingly, Googling that phrase refers to the 1637 Scottish Book of Common Prayer. This caused riots in Edinburgh. especially against Charles 1, and is widely regarded as amongst the roots of the English Civil War. So Naomi's reenactment theory is spot on. Hi philpot - that's interesting. I wonder if it is a copy of an older piece or a recent interpretation just using wording from that source. I agree with you both - reenactment seems very likely. All sorts of items are made for reenactments using traditional techniques and often of really good quality, so I think this fits in nicely. Hi Naomi - yes it is similar, but as you say, the mark is completely different. Also, I can just see an M in the image and that is different to mine, so I'm inclined to think any similarities are coincidental due to similar copying sources. I'll keep looking and let you know if I come up with anything.